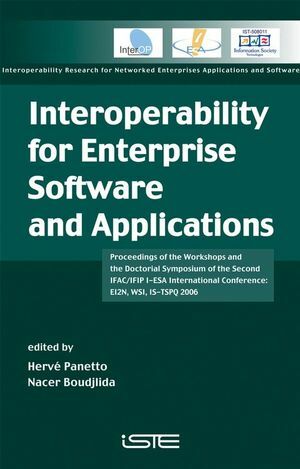 During the IFAC/IFIP I-ESA international conference, supported by the INTEROP NoE and the ATHENA IP, three workshops and a doctoral symposium were organized in order to strengthen some key topics related to interoperability for enterprise applications and software. The workshops were selected to complement the conference topics, providing researchers with more time to brainstorm and then to come out, at the end of the workshops, with new research directions for the future. EI2N 2nd International Workshop on Enterprise Integration, Interoperability and Networking. Session 1: UEML for Enterprise Applications Interoperability. Session 2: Ontologies for Applications Interoperability. Session 3: Collaborative and Networked Enterprise Interoperability. WSI 2nd International Workshop on Web Services and Interoperability. Session 1: Model Driven Architectures. Session 2: Web Services for Interoperability. IS-TSPQ 1st International Workshop on Interoperability Solutions to Trust, Security, Policies and QoS for Enhanced Enterprise Systems. Session 1: A Business and Requirements View. Session 1: Model Driven Development. Session 2: Business Process Modelling. Session 3: Software Development and Interoperability. Session 4: Enterprise Modelling and Knowledge Management.